Your author dropped in at the Tate Britain yesterday morning and managed to find shelter from the hordes of marauding little people in an interesting exhibition about the work of German-born artist Kurt Schwitters, with a particular focus on his time in Britain after fleeing from Nazi Germany. Thankfully, as your author's knowledge of European Modernism was basically non-existent, the exhibition provided all the necessary interpretation to make it thoroughly interesting. 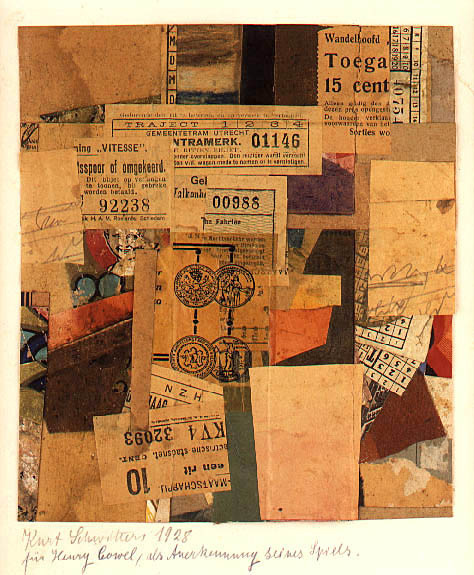 It charted Schwitters' journey via Norway to the British Isles - where he was held the Hutchinson internment Camp on the Isle of Man and managed to scrape together enough materials to continue producing art - and examined his stay in London before settling later in Ambleside, where he continued to produce art until his death in 1948.